a number of uses: the furoshiki. It is a square of fabric that you can knot in different ways to use as a bag, a scarf, to wrap presents, as a head cover and also as a decorative item for your home. It is similar to Tenugui, but bigger. Here are a few pictures and folding techniques. For example, today I went out with a furoshiki instead of a handbag, and was able to fold it into a backpack, and turn it back into a handbag by sliding the knot. It's so very light that it felt like a feather. Only con: if it rains, it's not waterproof (that I know of...). You can learn more techniques in this book. 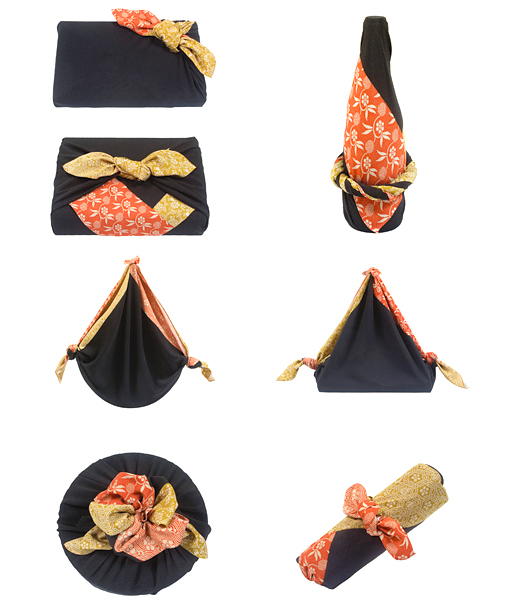 Furoshiki come in many sizes and colors, so feel free to choose whatever suits your mood! That's all folks!! Go have fun with your furoshikis and let me know what you think in the comments section! Thanks for reading! If you like this post, please subscribe to my blog (top right) and share!